I was recently introduced to Ravelry.com, a community site and pattern database for knitters and crocheters. And while Ravelry is a free platform for sharing project and pattern information, the best part about it is the social features. Ravelry users have the ability to rate patterns, post comments and alteration suggestions, and share their own project ideas with others. As a friend explained to me, “It’s like having 100 friends try a pattern before you and you don’t have to make all the mistakes they made.” You can read Ravelry’s about page for more info. Anyway, the main reason I’m posting about Ravelry here is because they have a pretty large selection of plastic bag crochet/knit patterns. 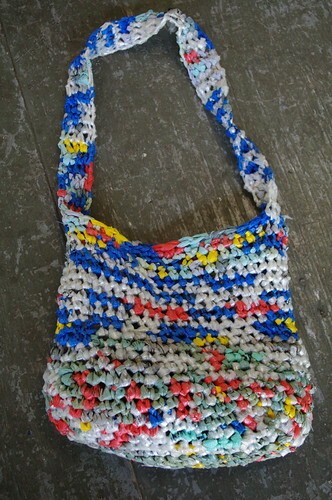 Here is their compilation of free patterns using plastic bags. You have to create an account to view the link, but that is free as well. Also…RecycleCindy is a frequent poster on Ravelry and has lots of plastic bag crochet patterns on her site, MyRecycledBags.com. I’m also going to post a link to Ravelry and RecycleCindy on my Learn Page as well.